Start with the ingredients that go on the side. It is quick and there is no stress when the soup is to be served. Cut the lemon into 4 half slices. Cut the chilli into thin slices. Rinse and dry the Basil and Coriander. Plate it with the lemon and chili. If you prefer, you can chop the herbs a bit, so that they are ready to sprinkle into the soup. 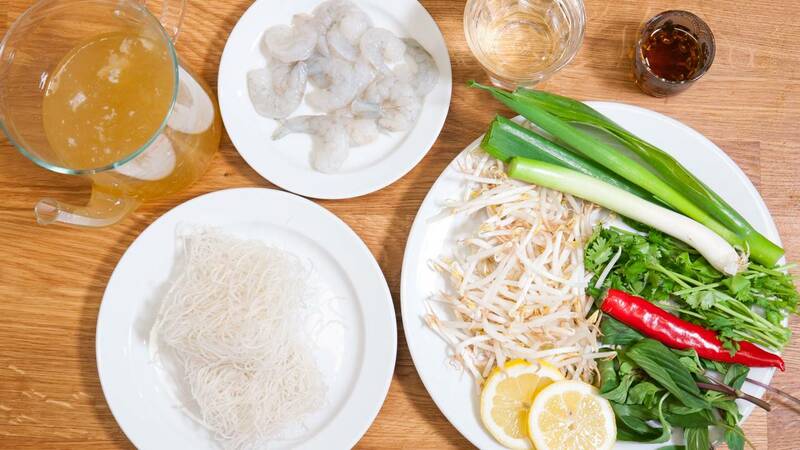 Rinse and dry the bean sprouts well, then place them on the same plate. Cut the spring onion in thin slices. Bring the soup to a simmer. Add stock, water, fish sauce and spring onion. Let it simmer for a couple of minutes so the spring onion get a bit soft. Add the prawns and simmer on for a minute or two. Prawns should only be heated to approx. 120°F (50°C) to be done. If they are cooked too long they will both shrink and become chewy. It should feel a bit like they are crispy when you eat them. As soon as they are opaque they are finished. It's not all types of prawns that goes pink. 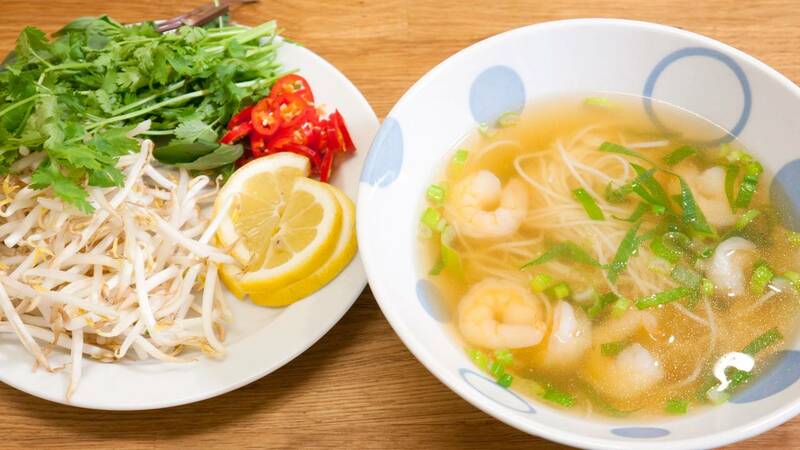 Add the noodles to a bowl, and pour the soup with the prawns over. Serve with the "on the side" ingredients. You can use any kind of noodle you prefer. Just follow the instructions on the package. The rice noodles I prefer are roughly the same size as a thin spaghetti. According to the package, they have a thickness of 1.2 mm (0.05 inch). If they cook for too long they fall apart. Then you know they need less cooking next time. 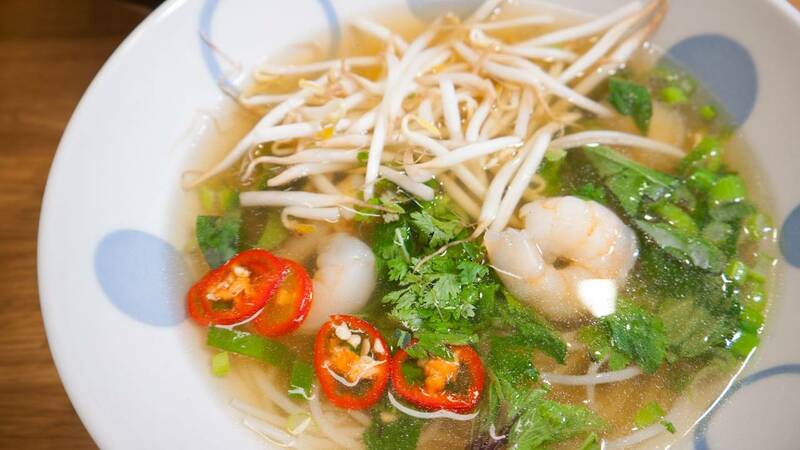 The rice noodles are usually gluten free, if you care about that. You can use whatever prawn or shrimp you prefer. I usually use 6 of the big tiger prawns per person. I have had it in many version instead of with the shrimp as main ingredient. use 3-4 oz (100 g) per serving.